23 Oct 2018 --- Provexis’ patented tomato extract has increasingly moved into sports nutrition applications, with Niamh O’Kennedy, Director of R&D, noting she is “optimistic” for a future sports nutrition health claim. DSM markets Provexis' tomato extract as Fruitflow, which has over 30 platelet compounds and is said to counteract the adverse effects of over-exercise on inflammation. Such effects of exercise are not understood enough by those who perform at high levels, such as professional athletes and marathon runners, O’Kennedy explained at the Food Valley Summit, held in Wageningen, the Netherlands on October 10th. “Platelets are not only related to heart health. Platelets are a mirror of your lifestyle. For this reason, we look at other areas in which platelets can be important. Not all exercise is good for you when it comes to overall and lifelong health. Intense exercise affects your blood platelets negatively,” explained O’Kennedy. 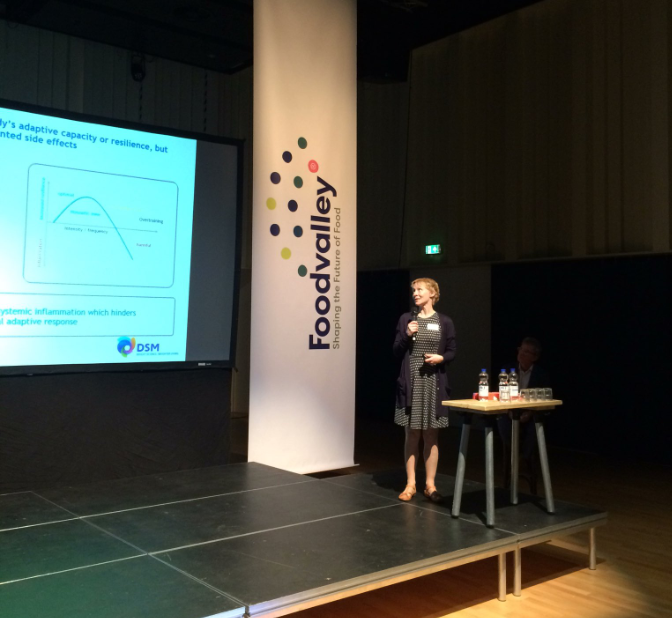 at the Food Valley Summit in Wageningen, the Netherlands. “Once blood platelets are activated, as they are part of the inflammation and immune system, the intense inflammation this triggers can lead to ‘stickier platelets,’ more coagulation and a higher rate of systemic inflammation. This is not adaptation based inflammation; this is low-grade chronic inflammation which is a load for the body to carry,” she added. Such adverse effects can be activated very soon after intense exercise and the system may remain activated for 48 hours. One large effect that comes with this process is a reduction in the body’s capacity to recover. O’Kennedy noted a recent study in which Fruitflow was tested on a range of athletes, from rowers to recreational athletes, to gauge how exercise affects platelets. “We used different types of exercises to get the effect in trained athletes versus the effects in the general population. In normal training activities, we found that Fruitflow almost completely suppressed the platelet activation and reduced the following inflammation by about half,” she told NutritionInsight. Next to the European Food Safety Authority (EFSA) claim on blood aggregation, O’Kennedy commented on the possibility for a sports nutrition claim at the summit. However, she noted that it does look “optimistic,” despite the lengthy process. DSM supplied professional cycling team, Sunweb, with Fruit at this year's Tour de France. Indeed, the importance of official claims and scientific backing for sports nutrition was highlighted at the summit. The increase of health benefits in sports nutrition being claimed directly or indirectly without scientific support and regulation could be a future danger.